← You need to spend $10 right now. 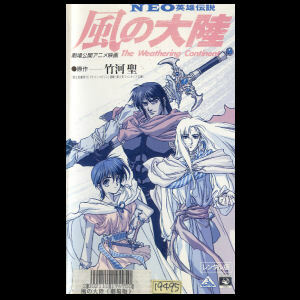 I have a long and complicated history with a rather forgettable bit of 90s anime called “The Weathering Continent”, or Kaze no Tairiku if you want to get all Japanese on me. Like a lot of anime, I ran across the name when I was trading VHS fansubs with a gentleman in Arizona who had an absolutely stunning list of tapes on offer, but also like a lot of anime of the day it hadn’t been fan-translated. So I didn’t see it back then. 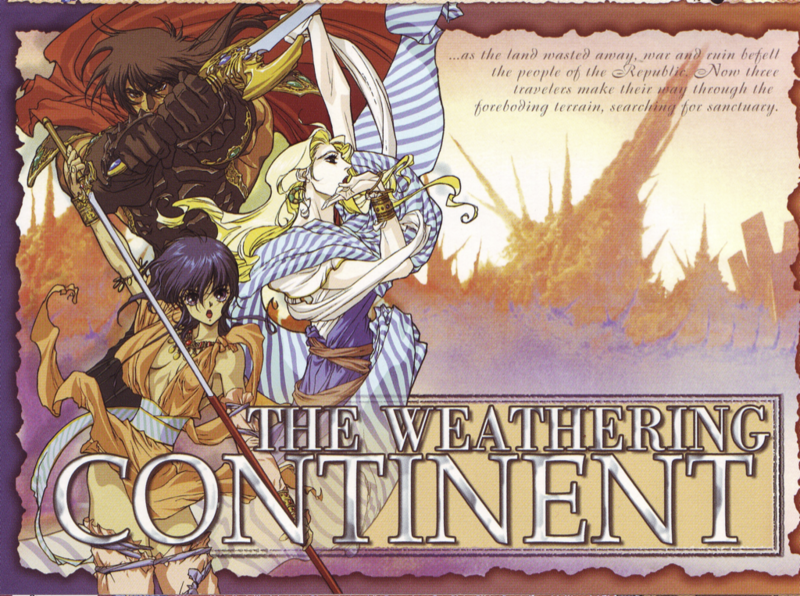 In 1995 or so, I bought a CD at Bunka-do in Los Angeles that was a collection of theme songs from various JVC/Victor properties, and one of the songs on the CD was the ending theme from Weathering Continent, and I quite liked it even if it was a bit slow, so I put the OVA on my “see this someday” list. Then, in 2002, Media Blasters licensed it and put it out on DVD and I bought it. Several months later, I decided I’d get around to watching it, took the shrink-wrap off, and found that the DVD case was, in fact, empty. I’m not sure if that was an error at the factory or whether it was just a case of a light-fingered employee armed with a shrink-wrap machine, but either way I didn’t have a DVD. In 2004, I bought ANOTHER copy, opened it to make sure that there was a DVD in it, and then put it on the shelf. This week I finally got around to watching it. It’s, well, it’s an interesting artifact of the time. 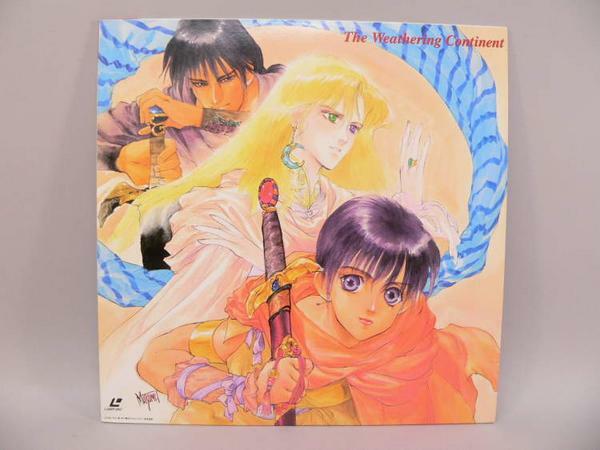 It’s about an hour long, to fit on one side of a CLV laserdisc, it’s based on a 28-volume novel series and obviously assumes that anyone spending Y7800 in 1992 to buy said laserdisc is familiar with the characters and their situations, so it doesn’t have any of that pesky backstory or characterization stuff to pad the film. Basically, it starts, the three main characters – who are traveling from Point A to Point C in search of water, and that’s all you know about them – run into a Plot Device and get redirected to Point B, which happens to be a rather creepy cursed city of the dead, there’s some Bad Guys who bring the Wrath of the Curse upon themselves, our heroes escape, there’s a bit of a melancholy ending, and then our heroes resume their journey to Point C.
Taken on its own merits, without the benefit of knowing the novels, it’s not all that exciting. I imagine that, if I were a fan of the novels, I might be excited to see my favorite characters in, you know, the flesh, or the cels as it were, but not being a fan of the novels it didn’t have a lot to offer. That’s not much to say about an OVA that I’d been vaguely wanting to watch for fifteen years, so I thought I’d spend some time making fun of the packaging. The front cover. The characters are, top to bottom, Bois, Teeye, and Lakcee, though they’re spelled differently in the actual subtitles when you watch the thing. Her … heart. That’s what she brings to the equation. Yup. Oddly enough, the original cover art for the Japanese laserdisc and VHS were bereft of fan-service, which really shook my world-view a little bit. 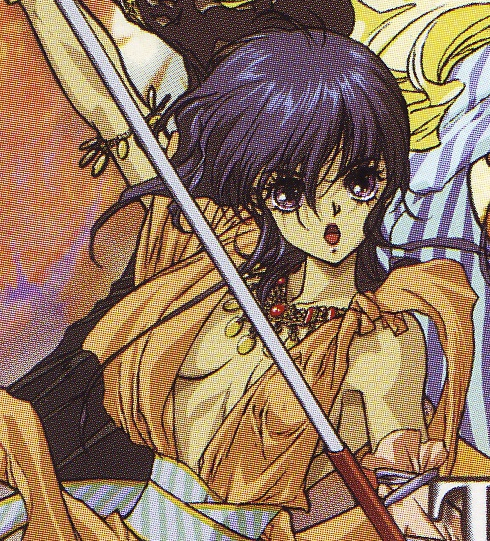 I find myself fascinated by the anime industry of the late 80s and very early 90s, when the effects of the bubble popping hadn’t quite crushed the long-form OVA industry; I think there’s a lot that could be said about the economic crash of the time and the effect it had on the anime biz, and I occasionally consider trying to make that into a thesis and run with it through grad school, but that might be just a little too much navel-gazing. This entry was posted in anime, random. Bookmark the permalink.